Aerospace Engineering senior Oyinkansola Elizabeth Olusola-Ajayi will be the student speaker for the A. James Clark School of Engineering's Spring 2016 Commencement Ceremony held Thursday, May 19th at the University of Maryland (UMD) Xfinity Center. Born and raised in Lagos, Nigeria, Olusola-Ajayi has always been interested in the intricate dimensions of technology and how people relate with it or are influenced by it. Being a firm believer in fighting for what you want, and believing anything is possible amidst challenging circumstances, she moved to the United States at 16 to study engineering at the University of Maryland. While here, she availed herself to the wealth of opportunities and pursued a major in Aerospace engineering while acquiring a minor in engineering leadership development. She also spent a semester abroad at the University of Sydney, Australia. She was heavily involved with the Peer Leadership Council and facilitated conversations around the meaning of leadership to enact positive social change. In the pursuit of her degree, she was able to work on design projects ranging from devices that enhance health informatics to airplanes that meet specified objectives. A budding public speaker, Olusola-Ajayi recently shared her “Fearless Ideas” on the virtue of resilience at the Terp Talks showcase. She is passionate about women’s socio-economic advancement through science and technology, and she has formed a partnership with one of her closest friends to start up a high fashion garment manufacturing industry in efforts to revolutionize the local garment tailoring for women in her home country. She is an aspiring writer and contributor to a lifestyle blog dedicated to helping people live the most authentic version of their lives. She would like to thank her family, friends, professors, mentors and the incredible staff members of the engineering department for all their hard work and support. 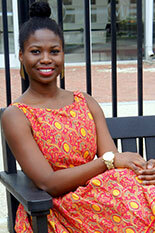 Olusola-Ajayi hopes to obtain some experience in the field before going on to law school to combine both worlds towards a unique outcome. Most importantly, she would like everyone to walk away remembering that each person occupies a unique space on this earth, but achieving and being the most authentic version of that self without apologies is enough.